A while ago, I wrote a review of Steve Jackson’s highly entertaining Zombie Dice game. There was a very silly expansion involving Santa and cheerleaders (and I mean that in a good way), which has now been followed up with a new stand alone game using the same background mechanic: Dino Hunt Dice. Unlike the previous game, where the premise was to eat as many yummy human brains as possible, this time you’re trying to capture dinosaurs for your zoo – I like to think of it as people too lazy to make their own Jurassic Park from scratch indulging in a bit of suicidal industrial espionage. As with Zombie dice, you get a cardboard dice cup with the game, although this one is a little dinkier than its elder sibling’s. You also receive ten dice and a mercifully brief sheet of rules. There are three types of dice, although the brains have been replaced with dinosaurs, and the shotguns with leaves. The footsteps remain, but their roles have been switched – instead of being a good thing, now they are a very bad thing indeed, and mean that instead of escaping, you’ve been “stomped” by an unhappy dino who didn’t appreciate your efforts to bag him. There are five green dice (apatosaurus), three yellow ones (triceratops) and two red ones (tyrannosaurus), with progressively more footprints and fewer monsters. Players take turns in selecting three dice from the cup, chosen at random and without peeking. They then roll those dice, and see what they get: dinosaurs are put to one side, as are stompy footprints. Provided all three dice didn’t roll stomps, then the player chooses enough dice to make their hand back up to three and rolls again, if they want to; leaf dice are rerolled. All dice are returned to the pot when players change over, with the running total of dinosaurs captured marked by tokens (which aren’t supplied). The first person to twenty dinos wins. This is a fast, easily portable game and a great deal of fun. Sadly, there doesn’t seem to be an accompanying app for this incarnation of the game. The lack of tokens is understandable as it will keep the costs down, but given the propensity of Steve Jackson Games to produce tie-in tat for Munchkin, I am a little surprised they haven’t done the same for these games – there is room in the cup for storage. 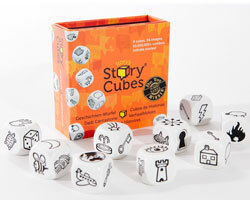 So when I found Rory’s Story Cubes in the mighty Leisure Games last year, I had to have them. Presented in a lovely little slipcase (the inner box has a magnetic flap to keep everything safe during transit), you get nine six-sided dice. But instead of dots, you have little cartoon pictures, ranging from straightforward items like an arrow and a pyramid, to slightly more abstract ones, like the comedy & tragedy masks and a demonic shadow. The idea of the game is storytelling: roll all nine dice then try to make a story using the images on them. It’s quite an entertaining little exercise to try this on your own, but taking turns with friends is where this game shines. Due to the random element of dice rolling, you never quite know what’s going to come up, allowing you to create some weird and wonderful modern fables, either co-operatively or competitively. And that’s basically it: the rules booklet is tiny and the instructions take up just over two and a bit inches square. The dice are sturdy and well printed, big enough for the recommended ages to handle easily but not too bulky for transporting here, there and everywhere (although apparently there are plans for giant ones, primarily for special needs children and group work). There is also an expansion set (“Actions“), which I have, and another one (“Voyages“), which I don’t (but intend to get hold of as soon as possible). Oh yes, and there’s the inevitable app for everyone’s favourite i-device – but heck, as fun as that might be, that’s not even real dice, so doesn’t actually count. As a roleplayer, I have a genetic predisposition towards buying dice of all sizes, shapes, colours and functions. It’s not that I need all of them; heaven’s above, no. But I can’t resist anything that has shiny, shiny dice in it (even if the dice aren’t actually all that shiny in and of themselves). So it was I found myself attracted to Zombie Dice, by Steve Jackson Games. I’m an utter wuss when it comes to horror movies, zombie ones included, although I did enjoy “Sean of the Dead” and “Pontypool”. But it’s a dice game, so how could I not buy it? And it’s from SJG, sainted doyen of the gaming industry, who brought us GURPS, Car Wars and Munchkin, to name but an illustrious few. What you get for your dosh is a cardboard dice cup with a lid, a set of incredibly short but perfectly clear rules and 13 dice (3 red, 4 yellow and 6 green). Each die represents a human victim that you, as the zombie, are shambling after. Shake the full cup of dice, take three out without peeking, roll them and see whether or not you’ve got juicy, juicy brains for tea (a brain), a mouthful of dust (running feet) or a shotgun in the face (BOOM!). The winner is the person who manages to get 13 brains in total. But it’s not quite that straightforward; despite the apparent simplicity of the mechanic, there’s a great deal of tactical play to be had (AKA pushing your luck). Each of the different coloured dice has a different ratio of brains to feet to shotguns, with red being the toughest, having only 1 brain and 3 shotguns (the exact opposite of the green dice). If you’ve rolled brains or shotguns on your turn, those dice are taken out of play and you must decide whether or not you dare try for more dice. If you get three shotguns in total, you’re dead and your score for that round is nothing. It’s trickier than you think and sometimes having nerves of steel is rewarded with an amazing streak of brains. But not always. You will need some sort of counters to keep track of how many brains you’ve scoffed throughout the different rounds; jelly babies would be quite good fun, because at least at the end of the game you could bite their heads off with a triumphant cry of “Braaaaiiiinssss!”. You might feel a bit sick if you tried that with all 13, though. If you’re more technologically minded, or just want a taster of what’s in store for you, then SJG have kindly done both a superb free app for the iPod Touch and iPhone, and a 59p upgrade with a few more features such as multi-player gaming. The app zombies have awfully punny names and do try to encourage you to get shot, the mechanic isn’t quite so transparent and the music will drive you mental if you leave it on (perhaps that’s the point) but may I remind you, it’s free! The Mirror’s Edge Review is up. Overall it’s an okay game when it really could have been amazing. Small things annoyed me and kept the game from being the wonderful thing I was hoping for.